Orders totaling over $75 and shipping to destinations within the continental (lower 48) United States will qualify for free ground shipping. We offer the following shipping methods by destination. We generally ship the same day your order is placed, during regular business hours and subject to the shipper’s days of operation, if your order is submitted prior to 3:30 PM Mountain Standard Time. Once your order is shipped, the time it takes to receive your purchases depends on the service you select, and any applicable holidays or service-affecting events (see the list below). 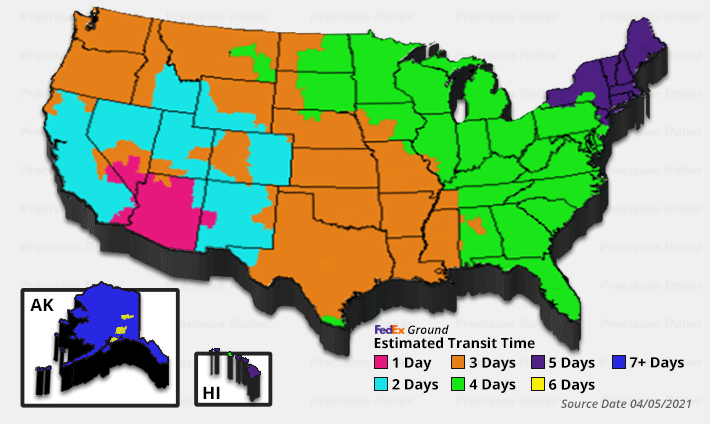 What are typical delivery times for FedEx? What are typical delivery times for UPS Ground? 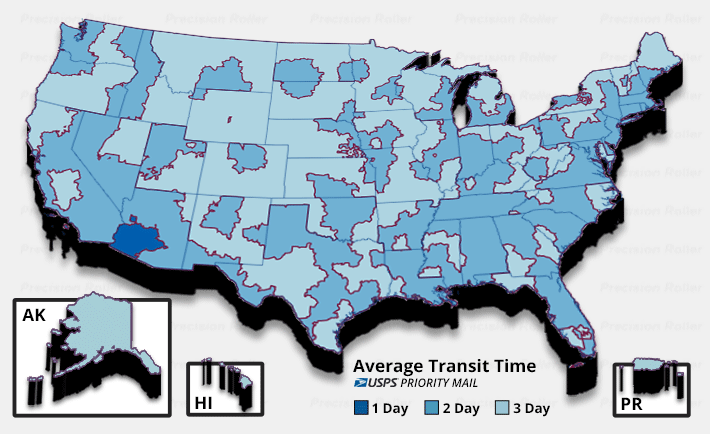 What are typical delivery times for USPS Priority Mail? What holidays affect the delivery time of my shipment? Each shipper recognizes several holidays that may affect the time it takes to receive your shipment. Events and weather may also add delays. We ship worldwide, including Canada, Mexico and all countries not otherwise specified in Destination Restrictions (below). Destination Restrictions: The following countries have restrictions that do not allow us to ship directly. Recipients in these countries will need to work with a freight forwarder in the U.S. or another non-restricted country. Please note that specific payment methods are required for international orders (see details). Does Precision Roller deliver to APO or FPO addresses? Yes, we deliver to APO/FPO addresses. APO/FPO orders are shipped by USPS Priority Mail. Delivery time once shipped is generally 5-10 business days. The tracking number for your order is automatically emailed to the address you provided during checkout. You can also find order status and tracking information here on our website, either by logging in or clicking the link in the confirmation email for your order. How do I contact FedEx, UPS, or USPS? First, verify that you’ve received a box for each tracking number associated with your order. If all boxes have been delivered but you’re still missing an item, check the packing material for small items. Please call our Customer Service at (800) 323-9523 if you’re unable to locate an item. Claims for missing items must be made within the first 14 days after the package has been delivered by the carrier. Does Precision Roller pay the return shipping cost for defective merchandise? If an item you buy from us is defective, we will gladly pay for the return shipping. We work hard to ensure we carry quality products, so if you have difficulty with one of our supplies or parts, we will replace it promptly without hassle at no charge to you. If you need to return an item that is not defective, we will be happy to accept it, but you will be responsible for shipping charges in this case. For more information, please visit our Return Policy page or see our 100% Satisfaction Guarantee page. When should I file a claim for a lost, damaged, misdelivered or tampered package? If your order was damaged, misdelivered or tampered with while in transit, please contact Customer Service within 3 business days of delivery. If your order was lost while in transit, please contact Customer Service within 7 business days of not receiving your order. Precision Roller may decide to package your items separately due to weight or size concerns, to ensure we are keeping your shipping costs as low as possible.